Today a business appointment took me to the suburbs of Washington D.C., so I had a chance to stop at Senator Clinton's national headquarters, located just outside the city. This meant that I got a tour of the functional but spartan offices of the people I usually communicate with by phone or email, and a chance to chat with them about the campaign, about people on the web helping each other help Senator Clinton, and more. I even had the chance to show several of Senator Clinton's most hardworking staffers the ever growing number of comment on why, how, and when Senator Clinton makes us smile. It was a delight to see the smiles on the faces of the Clinton campaign staff members as they read the comments. I departed knowing that Senator Clinton most definitely is in this race to win it. No signs of anybody packing up. 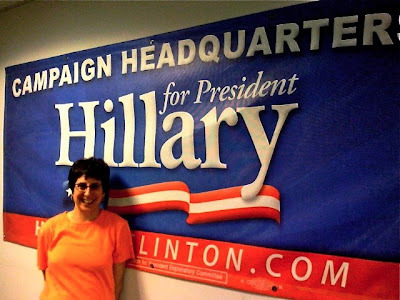 I also left knowing that the people at the heart of this campaign, like Senator Clinton herself, are paying careful attention to us "regular" folks who have voted for her, blogged about her, donated to her, and are determined to see her as the Democratic Party's nominee this November. Some speech! It certainly made me smile. On to the grand finale in Oregon!